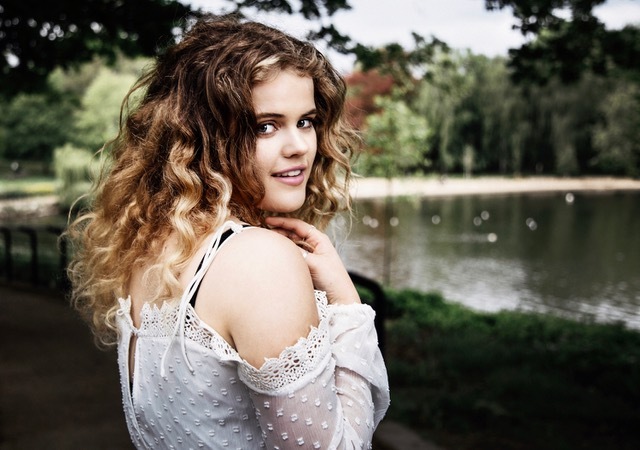 Daisy Clark, is the 19-year-old singer songwriter from Cornwall who became an internet sensation when she knocked Ed Sheeran of the iTunes chart (twice) with her cover of Hopelessly Devoted to You – a song from the 1970s musical Grease. Since then she has released Worlds Away – an original recording created in none other than Mark Ronson’s studio. “I’ve always loved music and performing, since I can remember, but it was when I had started secondary school and at that Taylor Swift was doing some fabulous acoustic recordings that I was really inspired to want pick-up and learn to play the guitar; to write and perform my own songs. “My teachers were amazing – I went to Newquay Tretherras school and the teachers were always encouraging me. I used to entertain the students at morning assembly with my own original songs – it was a really supportive atmosphere. Recently I went back to my primary school and played for the little ones there – it was amazing. “I was just a normal girl, (I am still a normal girl) doing YouTube videos and gradually I got more and more exposure – it’s been a pretty smooth journey. I think the most exciting thing for me so far was the morning after I knocked Ed Sheeran of the iTunes chart – I got a message from Dawn French! I got lots of lovely messages from people I know, people I don’t know and famous people! “I love Cornwall, I love everything about it – the surf, the beaches, the chilled gigs on the beach – always has a festival vibe, but I think mainly what I love about Cornwall are the people. I have a very close circle of friends and that’s where I get my inspiration. and maybe I should go to University- but, then again maybe I shouldn't..."
“I write about my own personal experiences or the experiences of those who are close to me – that’s how World’s Away came about. “Choosing music as a career right now and not going to university is a risk – but I am super happy. I’m really positive and feel certain that I have made the right decision. To be honest whatever we do has an element of risk – and this feels right so I’m going for it. “My parents are amazing, they are so proud of me; my mum is my number one fan, she is so supportive and she comes to all of my gigs (dad is equally supportive). “To be honest, most people are happy for me and supportive – Cornwall is that sort of place. I did have one issue with someone at school who is far more academic than me – she was patronising towards me, but I wasn’t going to let her opinion stop me – in fact I wrote a song about her – it’s called Straight As. “I’m in such a great place right now – I love listening to Julia Michaels’ ‘Issues’. I have done a stripped down version – it’s my favourite song. It’s quite poppy, but when you strip it back, it’s a really beautiful song. “It’s a crazy time right now and I’ve got lots to look forward to; I’ll be recording some of my original tracks in the studio, tracks that are really personal to me, I’ve got a few gigs coming up and I hope there will be an album soon. “The best advice I can give to anyone thinking of doing similar – is that if you’ve got the passion and the drive – and you know if you have. You can’t listen to anyone trying to put you off – I know it’s difficult, music is not a guaranteed job, it’s not a certainty – but stick with it, it’s amazing! #Fifa18 review: Does the latest instalment live up to the hype?